This week my mom is visiting from Texas and we love having her here. She has been so helpful around the house and worked with us to complete Baby's room. She was also the deliverer of our crib bedding and nursery goods. 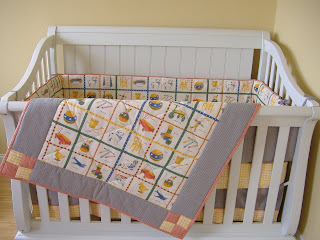 My grandmother is an amazing seamstress and she made all of Baby's bedding and curtains for us. 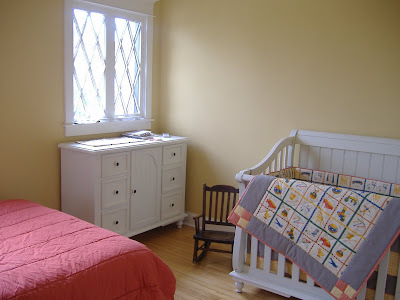 We are so happy to have a homemade nursery we can keep forever. It's so special to know she made it for us and we will always be able to tell Baby (and future Babies) that Maw made their bedding especially for the Reynolds family. The room still needs a few touches...like things on the walls. But I am really happy that the onesies are in the drawers and the crib is all ready. Now we are just waiting for Baby - we can't wait to see if it's a boy or girl. Such a fun surprise! This is the quilt and bumper. Notice that we selected a material with dolls, doggies, balls, and crayons to go with our neutral theme. SOOOOOOOOOOOOO CUTE!! I love it!! Beautiful and classic. 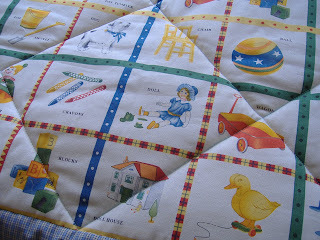 What a treasure for your baby(ies) to have from their 'great' grandmother. Love the nursery! Your grandmother did an amazing job!